It's that time again! 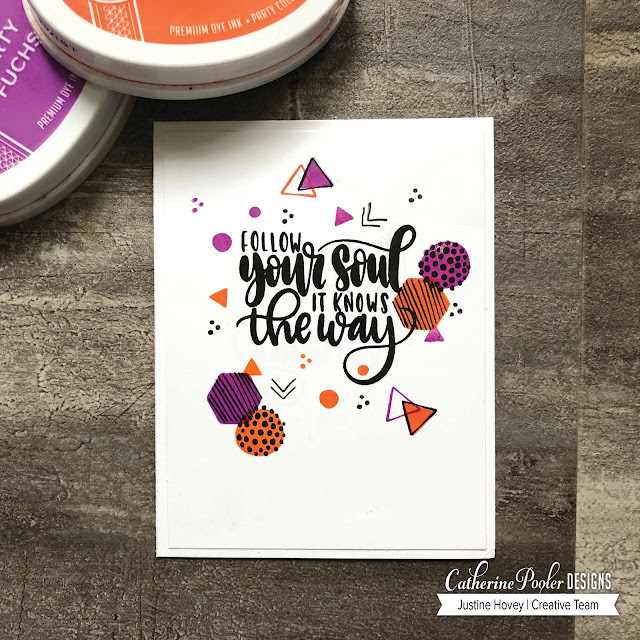 The Catherine Pooler Stamp of Approval Collection is being released on July 18th and we are celebrating with tons of inspiration on how you can use this collection of stamps and dies. 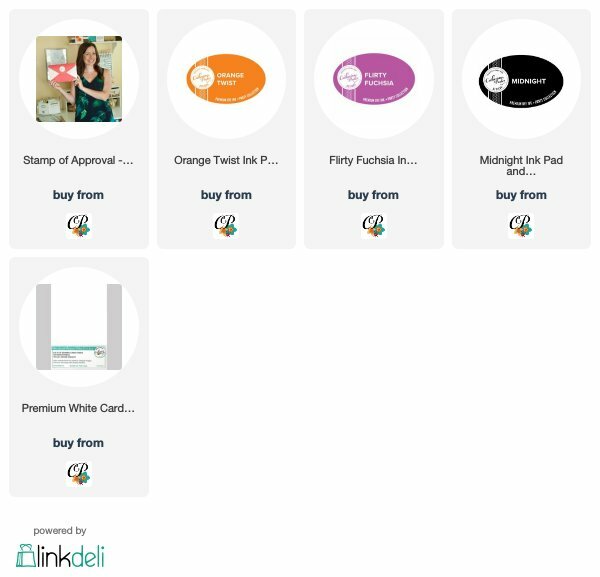 Stamp of Approval is a collection of themed-products that are available at a reduced price. You need to sign up for the waitlist and you will then receive a link to shop before (and if) if goes live to the public. I had lots of fun creating two card with Flirty Fuchsia and Orange Twist inks. I used the inks to even colours my die cuts to make them look like coloured cardstock! The stamp with all the brush-lettered sentiments is my absolute favourite! I just adore all the little sayings and how they are such a focal point on your card. I decided to do some random stamping with all of those little stamps that are often found but ignored on stamp sets. You can create a fun collage of images around a sentiment with them in various sizes and colours. Giveaway!!! 3 random winners be chosen to receive $100 Gift Certificate to the shop. Winners will be announced July 20th on Catherine's Blog! Great cards and I love the color combos!! Love love love that second card. Somehow the sentiment and random stamping (in gorgeous colours) are a perfect match. I'm really enjoying seeing all the ways to use that hexagon die set. Love your color choices too. Great examples of using colors on opposite sides of the color wheel - orange twist and the fuchsia purple. Simple yet gorgeous. Love your inspiration. I absolutely adore this SOA. The Cabana tiles are definitely a favorite. Loved how you made that first card with odds and ends and it has such a pow factor. The tiles are my favorite die. Those are lovely! I would not have thought of that color combination but it's perfect. the 'neglected' stamps, so cute and so appropriate. thanks for showing how they can be stars. These are all stunning. I adore the color choices! Thanks for showing your awesome cards, can’t wait to get mine! I love how you used the geometric stamps. I think those are going to be my favorite in this collection! Super cute cards! Love them all! Fun cards! I love the geometrics and your color combination of fuchsia and orange! Amazing cards Justine and I love the colors you used. Love these and the color combo, which is typically Halloween colors. Really like your cards. I forget to just use shapes. I love all the "littles" too!They can make a full card design all by themselves! Love these cards...especially for guys... great Fall colors! Wow! Love this color combination. Great cards! I love the festive vibe your cards give off! Such fun! Justine, your cards are awesome! Love the colors choices, awesome. Thanks for sharing and for being apart of this fabulous Blog Hop. Always a pleasure seeing your work. I always love your cards and creativity!! Great cards! I love the cabana tiles and how you used the geometric stamps. Thanks for sharing. The inspiration cards are gorgeous. And I love the sentiments! Justine, your cards NEVER disappoint! I love how simple, yet stunning they are! You inspire me! WOW! always love what it design. Can't wait for this collection. Love tour cards. Flirty fuschia and orange twist are a great couple. I LOVE you, Justine. Your cards are awesome like you. I love these color combo. I watch all of your You Tube vids, they are great. Thanks for sharing on this release. Keep those geometric designs coming-they look great! Love the orange and purple combination. The designs are free-form and fun. You’re so creative! Love how you used all the little bits to make a big impact. These cards would be great for sending a friend or child off to college with these colors. The sentiments work well with them too! Always a fan of your cards, Justine! Love your cards and color combos! As always, Justine, fantastic cards. I'm so glad you designed these cards! I didn't imagine how cute the triangles, hexagons and circles could be! I love those hexagons! They're so much more versatile that I imagined! Thanks for sharing your creativity and talent! I think i really needed the inspiration of this blog hop!!!! What fun cards!! LOVE the graphic look of them and those hexagon inlays are so awesome!! I love the orange twist and flirty fuchsia color combo and I cannot wait toplay with the cabana tile dies!! Really like the use of the colors flirty fuschia and orange twist...never would have tried that combo. The geometric stamps are so fun- I'm loving them, great cards! Love the clean and brightness of these cards. Those cabana tiles are calling my name! I love the way you used them with just a simple color combo! Fun color combination, and those cabana tiles are going to be fun to use. Fun cards. I enjoyed seeing the use of the "extras" which are part of a stamp set. Fun cards and such a great new collection! Thanks for sharing your ideas with us!! I love these sweet creations of yours!!!! Fantastic cards, Justine! I can't wait to get this collection! Neat idea to make use of the small images that come with most stamp sets. Always enjoy what you come up with, Justine. These colors are so eye-catching. Such fun cards, Justine. Love the color combination. Love that you went with one color combo (and a great one) for these cards. They are both so different, could not pick a fave. I am stoked to get this set. I really love the cabana tiles card. Great ideas. I’m agreeing with previous commenters: great colour combo and striking CAS style. You had fun with those little stamps! All gorgeous colours, all good fun. I love it! Thanks for sharing your cards with us. I like them both. Love the orange and purple combo!!!! Oooh awesome colour combo Justine! Loving the style of your cards. They're awesome. Great cards! Love the colours! Nice cards - love the way you did the backgrounds. Justine, I love how you used all the different shapes to create your card. I'm loving these hexagons!! Very cute. The orange and purple remind me of Halloween. I love these. Gorgeous cards. I love your clean & simple style. I think my favorite stamp set from the collection is the Tropically Yours with the borders in a close second. And those dies are pretty cool also. I always say that I have enough stamps & dies and then I see the first product reveal and oh well. What's enough? these are awesome. Love the simplicity. I just love the sentiments! Unusual color combination but it works! Great cards from a superb release. Oh, my... 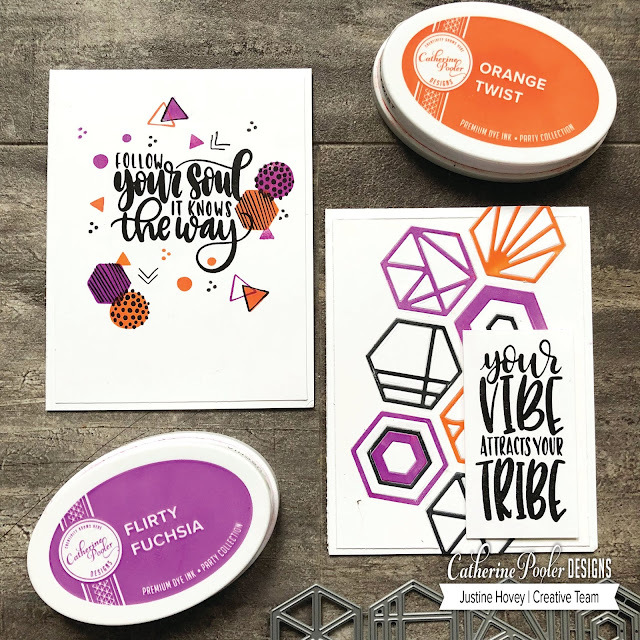 I love how you used the small stamps to make a collage and those colors, Flirty Fuchsia, Orange Twist and Midnight. I like your color combination. Super fun and festive cards! Terrific layouts and wonderful color combination. Great cards! I love the color combination! Love the cards and the colors. Like the use of the little shapes. Never quite know what to do with them. Beautiful cards, love the color combo you chose! Very retro and fun! Love those geometric shaped stamps/dies! Love both your cards. Very pretty! Justine, your cards are fantastic Thanks for sharing! Purple and orange - who knew they could look so great together?! PRETTY and UNIQUE cards! The Purple and Orange combination very nice and different! These cards are FUN! Love the cluster of random stamps with sentiment card. Great color choice with orange and fuchsia inks to color your cute cut shapes. It's a fun way to use the dies. Beautiful combo of colors and layouts!!! Love your cards and your color choices. Thank you for sharing! The 'Follow your Soul' card is super cute! 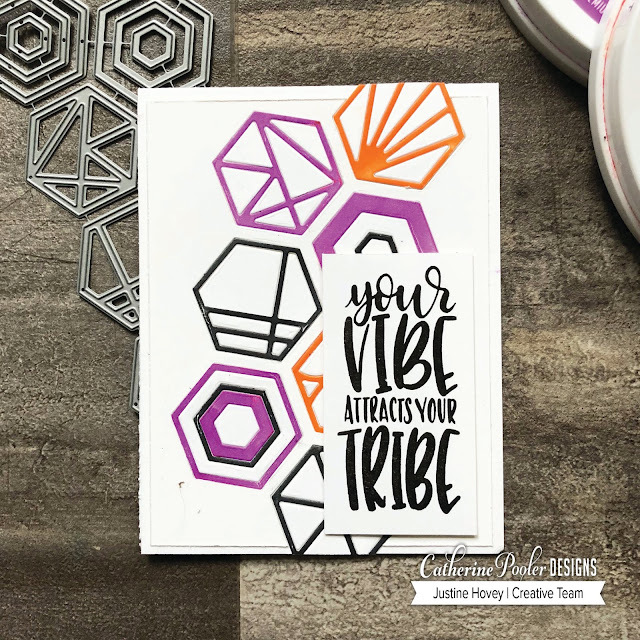 I love the color palette you chose along with the organic feel of the image stamping! Great ideas. I love the flirty fushia and the orange twist together. Nice cards. I really like the color combination - wouldn't have thought I would like that combination, but I do. Purple and orange is my number one seed on color combinations! These cards give me life. I really like your color choices for these cards, they are lovely! I love the color combination on these cards!! Love how you used the little stamps on your Follow Your Soul card. Really like the orange twist and flirty fuchsia combination! Love how bright and colorful these cards are!! Great cards!! As usual, your cards are great. I love all the geometrics this collection has to offer. Can’t believe you just used 3 colours- very striking. I do like the cabana tiles die set...... it’s growing on me more and more. Love your neglected stamps card. Love your bright colors, Justine! These sentiments are all so impactful and the geometric design is lovely on these cards. I love your clean and simple cards! They're really inspiring! This SOA is amazing, and everyone's cards are gorgeous. I love the color combo and the fact that you paired it with graphic designs!!! Neat way of using those stamps. I see they can be very versatile. Love these the colours are amazing. Oh !! I love your color combo so much !! Love the color combo of Orange Twist and Flirty Fuchsia! I never would have thought of using those two together but they are so striking! Love both your cards, especially your second card with all the small pieces as a background! I really like your geometric card designs with the dies and stamps! It shows us a whole different way to use the kit elements. I've really loved seeing all the designs from this SOA collections. Such fun and colourful stamps and inks. I love your simple designs, Justine - just fabulous! These are great. Love those cabana tiles !! Awesome cards! Love the color combo! Fantastic cards! I love the purple and orange combo! Fun color combo. These cards are so pretty and love the simplicity. This is a great collection. Great ideas with the cabana tiles. Super cards, love them! Pretty cards. I love the look of purple and orange together!